The Bay Area is home to food trucks that specialize in Eritrean-Irish fusion cuisine, Hong Kong-style egg tarts and curry fish balls, and tacos of every conceivable ethnic origin, among countless others. 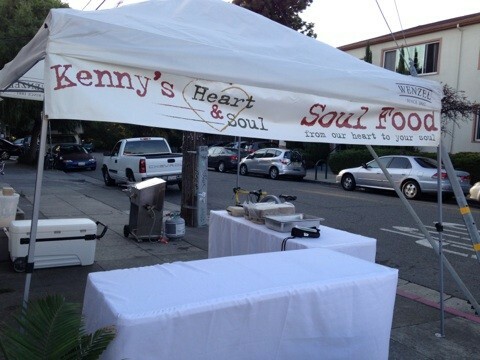 So it’s somewhat amazing to consider that Oakland resident Kenny Stuckey’s new venture, Kenny’s Heart & Soul, may become the first soul food truck in the Bay Area. Straight-up Southern soul food is precisely what Stuckey, a first-time food business entrepreneur, plans to introduce to the Bay Area’s street food scene: fried chicken, collard greens, potato salad, black-eyed peas, smothered steak, barbecued ribs, and more. Kenny's Heart and Soul: First Friday setup. As for why there aren’t other food trucks that specialize in the cuisine, Stuckey said he believes it’s largely a matter of economics. Most notably, a new, fully equipped food truck often costs around $100,000. That initial barrier to entry, combined with the fact that soul food is a notoriously labor-intensive cuisine (and one that might seem less obviously lucrative than other, trendier food concepts), likely makes it cost-prohibitive for many. Stuckey and his business partner have already purchased a truck, but still need to outfit it with a kitchen equipped with everything he needs — a stovetop, oven, and deep fryer, for starters. The project will cost upwards of $65,000 to complete, which is why, a year after Stuckey first started planning Kenny’s Heart & Soul, the truck has yet to become a reality. But even though a recently concluded $20,000 Kickstarter campaign fell well short of reaching its target, Stuckey said he hopes the truck will be able to hit the road within the next couple of months. He said he’ll likely launch a new campaign on a different crowdfunding platform — probably IndieGoGo — and is in talks with a number of private investors. Plus, Stuckey has applied for a $50,000 loan from the Oakland Business Development Corporation and said he feels confident that it will be approved. In the meantime, you can try out Stuckey’s food at a number of recurring pop-ups in Oakland. Every first Sunday, from 11 a.m. to 3 p.m., Stuckey serves a full soul-food menu outside the East Bay Church of Religious Science (4130 Telegraph Ave.). And twice a month — on First Fridays, from 5 p.m. to 9 p.m., and every third Saturday, from noon to 4:30 p.m. — he does a chicken fry at the Sacred Wheel Cheese and Specialty Market (4935 Shattuck Ave.). 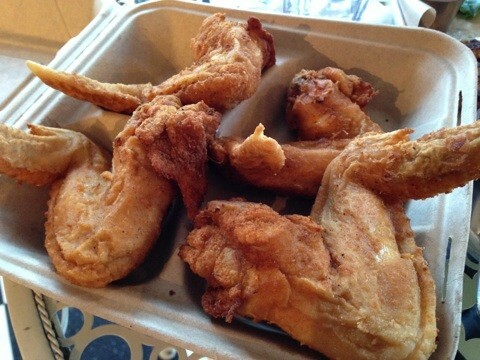 I had a chance to sample Stuckey’s fried chicken wings at a recent First Friday pop-up. Priced at $3.50 apiece, they’re huge, three-bone specimens — “pterodactyl wings,” as Stuckey called them. He brines the wings with a proprietary seasoning blend, then dusts them with just a little bit of flour before dropping them in the deep-fryer: “I really think that people should get chicken and not batter. I want to get right to the chicken,” he explained. They’re good, juicy wings. The next Sacred Wheel pop-up will happen from noon to 7 p.m. this Saturday, October 26 — the fourth Saturday of the month instead of the third, to coincide with a party that the cheese shop will be throwing.